Notes: Ex-CSXT 700 "Spirit of Cumberland"
Description: SD70MAC No. 4500, the Spirit of Cumberland, rolls through the early morning fog with a long coal train. Description: Second unit is CSX #4500 "Spirit Of Cumberland"
Description: CSX 4500 "Spirit Of Cumberland"
Description: The "Spirit of Cumberland" eastbound in Westfield with Q168. Description: A773 comes by another day, this time with some newer power, including the "Spirit of Cumberland". Description: The "Spirit of Cumberland" southbound at Haverstraw Tunnel with Q118. Description: Ex-CSXT 700 "The Spirit of Cumberland" leads out of Taft. The loss of Q177 into Taft has ended the same locomotives running out of Waycross in captive service, allowing for variety again. Been a long time since the 4500 block has been occupied on CSXT's roster! Description: CSXT #4500 Spirit of Cumberland waits at FX Tower before heading north. Description: Northbound CSX mixed freight Q438 crossing St Paul's Avenue at CP Marion. Description: Six unit CSX northbound mixed freight Q438 passing through CP Marion. Description: CSX Q62004 takes a heavy train south. 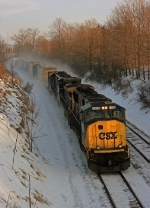 Description: CSX Q62007 heads south. Description: A rare visitor to the B&A. Description: CSXT 4500 "Spirit of Cumberland" is the trail engine on NS train O71 (CSXT detour). Description: CSXT 4500 SD70MAC “The Spirit of Cumberland” is sitting on the east leg of the wye at UP’s Beaumont Yard Roundhouse in Beaumont, TX. Description: CSXT 4500 'The Spirit of Cumberland' sits at UP's Beaumont Yd. Description: A look at the cab of the CSXT 4500. Title: CSX 4500 "Spirit Of Cumberland" In Depew Again!! Description: CSX Q389-24 at Pawnee Rd. Description: CSX Q389-24 at Pawnee Rd. The leading unit is the "Spirit of Cumberland"
Description: The Spirit of Cumberland pays a visit to West Newton as it leads a westbound train to Illinios. Title: The "Spirit of Cumberland"
Description: Two days later, the Spirit of Cumberland makes its return trip from Clearing, Illinios on Q388 bound for Cumberland, Maryland. Description: Q370 passes by an Elsmere CPL.